Born on July 28, 1933, Ahenakew grew up on the Sandy Lake First Nation (now the Ahtahkakoop First Nation). In 1951 he married, but soon after joined the Canadian Army, with which he saw action in the Korean War, and served with the NATO forces in Germany and along the Suez Canal. In 1964 Ahenakew was decorated for distinguished service and good conduct, and in 1967 he retired from the military and returned to Saskatchewan. Accepting a position with the Saskatchewan government as a placement and training officer, Ahenakew began working with band councils. In 1968 he took the position of communications worker with the Federation of Saskatchewan Indians (now the Federation of Saskatchewan Indian Nations), and eight months later was elected chief of the organization. He maintained that position for the next ten years. Ahenakew was a key figure in developing the Saskatchewan Indian Cultural College (now Centre) in 1972, and the Saskatchewan Indian Federated College (now First Nations University of Canada) in 1976. He served on the executive of both organizations for many years, and in 1976 received an honorary LLD from the University of Regina. Ahenakew successfully negotiated between the federal, provincial, and First Nations governments for changes to curriculum content and educational opportunities for First Nations students. The 1972 report Indian Education in Saskatchewan suggested changes that have now been implemented and have had positive effects on the education levels attained by First Nations students. Ahenakew helped to develop a radio and communications network for Saskatchewan’s First Nations people and to establish the Special Constable Program, a First Nation contingent of the RCMP. In 1978 he became the first recipient of the John Stratychuk Memorial Award from the Saskatchewan Human Rights Association, and received the Order of Canada for his unswerving dedication to the advancement of First Nations rights. Ahenakew was active in the development of the National Indian Brotherhood, and when this organization became the Assembly of First Nations he was elected as its first leader in 1982. 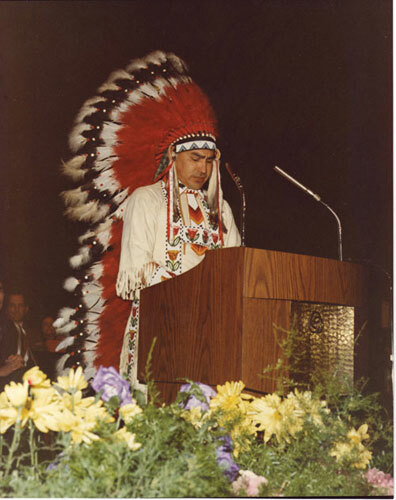 Defeated as leader in 1985, Ahenahew continued his role as senate Chair within the Federation of Saskatchewan Indian Nations until December 2002, when he was forced to resign following anti-Semitic comments he made to a reporter. At that time he was also suspended from the board of the Saskatchewan Indian Federated College. In 2005, Governor General Adrienne Clarkson signed a revocation ordinance, stripping Ahenakew of his membership in the Order of Canada.